Arab books face numerous challenges, and Arab publishers consistently invoke the following, in order of priority: piracy, lack of systematic distribution channels, censorship, and differences in purchasing power across countries. Today, while some difficulties may have increased, others have eased. In 2012 and 2013, sales appear to have dropped by 20%. To take two different examples, sales have dropped by 90% in Syria, and 40% in Egypt. Although the Syrian figure can be accounted for by the ongoing conflict, the Egyptian case is more complex. 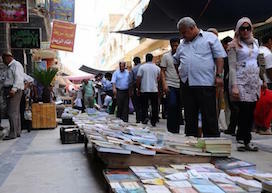 Before 2011, some 70% of sales during the Cairo Book Fair came from foreign cultural institutions replenishing stocks. Such buyers included European libraries and bookstores, as well as neighbouring Sudanese and Libyan cultural institutions. The Egyptian National Library accounted for 15% of sales, and Egyptian readers – for whom Lebanese books are often too expensive – the remaining 15%. With the turmoil in Egypt, none of these foreign buyers visited the Cairo Book Fair. Thus, while the Egyptian unrest did not prevent publishers attending, it did discourage foreign buyers. Economically, the fact that international Arab cultural institutions are unable to visit is catastrophic for publishers. Socially and culturally, it means that Syrian, Libyan and Sudanese readers will have access to even fewer titles. Conversely, the uprisings have also revealed the existence of new markets. Political books are today the best-selling titles across most Arab countries. These are mainly political Islam, and political theory. Under Ben Ali, for example, political Islam titles were censored, unavailable in Tunisia. With his departure, political Islam became the most popular topic not only in Tunisia but also in Algeria, Morocco and Egypt. On the other hand, while political Islam was the most popular topic in Iraq after the fall of Saddam, Iraqi readers today have moved on to books on political theory. It’s unclear whether North Africa readers will follow suit, but our publisher’s personal view is that the move reflects the maturation of readers’ political thought. Surprisingly, this negative impact of the uprisings on book sales is not what worries our publisher most. The main problem remains piracy which, given the circumstances, is unexpected. It’s difficult to estimate the number of pirated copies sold (a minimum of 40% it is suggested) but it’s striking that, despite the grim political situation, publishers still consider piracy their main problem. So what has changed, apart from the fact that books are perhaps even more inaccessible, and piracy as common as ever? With Arab unrest making the distribution of print books more difficult, ebooks acquire further relevance. Five years ago any casual conversation on the subject with an Arab publisher would have met with scepticism – publishers fear losing control of their content and considered ebooks a way of facilitating piracy. Today, however, most have embraced ebooks. Some are convinced, others submit to the unavoidable tide. Yet the fact remains that many of the most important and reputable publishers are today collaborating with an ebook publisher (see www.qorodoba.com) when they are not e-publishing in-house. When asked if ebooks wouldn’t be a solution to the increased distribution difficulties, our publisher is surprisingly enthusiastic. With ebooks, the problems of distribution (absence of distributors, censorship, political instability) can be overcome. As for piracy, it would remain an issue, but there are now more possibilities for control. And most interestingly, unexpected benefits seem to contribute to publishers’ recent change of heart. The tragedy of piracy is the lost opportunity it represents. The major difference in purchasing power across countries can sometimes explain piracy, but not always – some publishers adapt their prices to the markets, willing to reduce margin in order to maintain volume. Although this is not the place to reflect on the reasons why piracy is so widespread, perhaps one should ponder the other side of the coin. If books are being pirated, it surely means there are more readers out there than we think. So the challenge for the publisher should be to identify those readers and reach them. With the spread of digital content, publishers are starting to glimpse this previously imperceptible market, and some of the formerly invisible readers are starting to shape up. Our publisher explains that ebooks do not yet meet his expectations: sales are far from compensating for other losses, and ebooks are sometimes hacked. However, ebooks have also brought an unexpected benefit: efficient publicity. There’s little publicity for books in the Arab world but if the mere availability of ebooks on sales platforms has impacted on readers’ behavior, what difference might organized publicity make? People cannot want a book they’ve never heard of! Publishers are gradually becoming aware of a new challenge to be met: the need for information and diffusion. The more information is available, the more readers are exposed to books – and the more readers will read. Information is key, both for developing book sales and, crucially, for increasing the quality of books available and gaining more readers. Surely the time is ripe to create a new and independent source of book information, the sole short-term purpose of which would be to inform readers as to the availability of books. Its longer term purpose would be to provide publishers with valuable information regarding reader tastes and, last but not least, to contribute to establishing quality standards (see www.muwak.com).